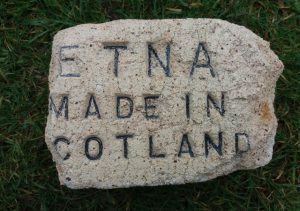 The Etna Works at Bathville near Armadale began operation in the 1860′s and, among other fireclay products, produced a common building brick. 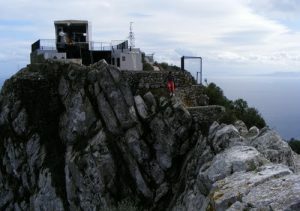 The works were modernised in the 1950′s, and new kilns built in the 1960′s. Production of red common bricks continued into the 1990′s. 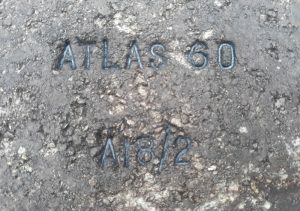 These works were situated directly Between the Bathville Brick Works and the Atlas Brick Works. Below – 1896 – Etna Brick works. 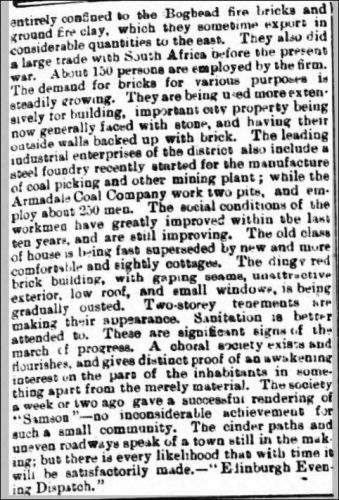 16/02/1898 – Glasgow Herald – Bricklayers wanted at Etna Brick Works, Armadale. Below – 05/05/1900 – Glasgow Herald – Foreman wanted for Etna Brickworks, Armadale. Must have experience in Hoffman Kilns and brickwork machinery. Apply by letter stating experience and wages wanted to James Wood, 28 Royal Exchange Square, Glasgow. 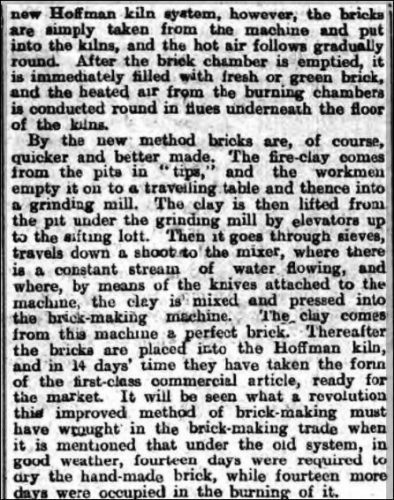 22/01/1902 – The Scotsman (I am uncertain which Armadale brick works this article refers to but I have included it here so that it does not go unmissed!) 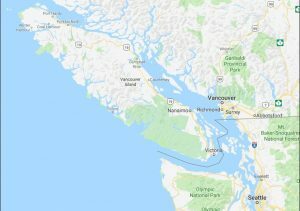 – For sale belonging to the Executry Estate of the late Mr Marshall, Contractor. Portable engine at no 9 pit, Armadale, Bricks large quantity, Fireclay pipes large quantity and various sizes, Whinstone sets and couplings, freestone jambs, Pan Mill at New Brick Work, Armadale, Bricks (40,000 already cleaned at No 8 Pit, Freestone large quantity not including iron. The articles will be shown to enquirers Mr David Sclater, Clerk of Works, Uphall. 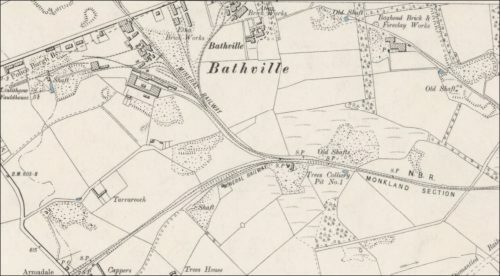 Below – 21/03/1902 – Linlithgowshire Gazette – An article discusses the Boghead, Bathville, Enta and Atlas brick works of West Lothian. 01/07/1902 – Dundee Evening Telegraph – The Scottish Coal Combine – Today the various collieries and brickworks belonging to Messrs James Wood Limited and the collieries belonging to the Armadale Coal Company will be formally handed over to the syndicate known as the Scottish Coal Combination. Yesterday representatives from the Glasgow office of the Combination for stock taking purposes made a survey of the whole material on hand, furnishings and coal etc, exclusive of the working colliery plant at the different collieries, along with the coal foremen. 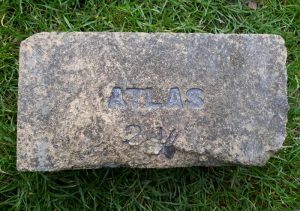 Messrs James Wood Limited own the following collieries in Armadale district: No 2, No 8, No 6 pits, Polkemmet, No 4 Hartrigg, Nos 2 and 7 Northrigg and Colinshills and also the well known Atlas and Etna brick Works. They further own Drumpelier Colliery, Coatbridge, Meiklehill, Kirkintilloch, and Neilston Colliery Kilsyth. They employ over a thousand men in Armadale district. The Armadale Coal Company own the 2 pits Nos 17 and 23 Buttness. 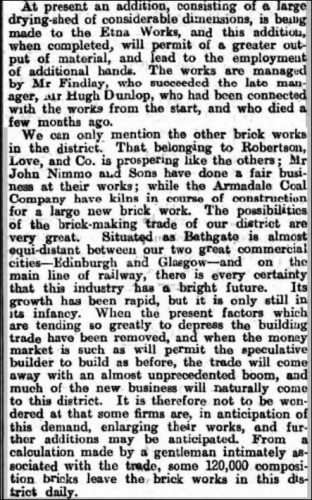 Below – 27/08/1909 – Linlithgowshire Gazette – Etna and Atlas brickworks excursion to Portobello. 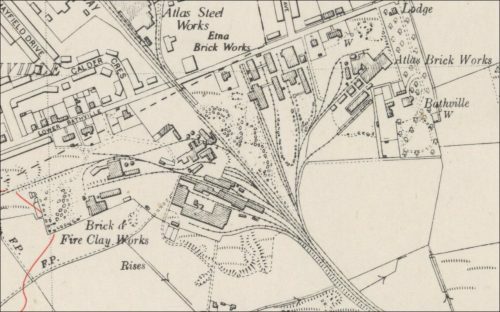 Below – 21/10/1910 – Linlithgowshire Gazette – Death of Duncan Richmond former manager of the Atlas and Etna brickworks , Bathville. He started work at the works around 1885. 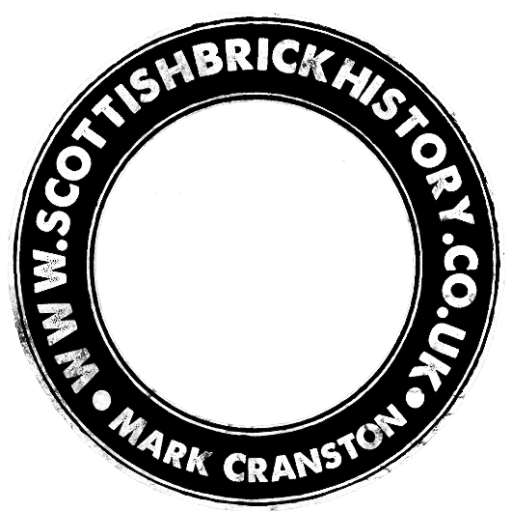 02/12/1931 – Falkirk Herald – West Lothian Industries – Promising Revival in Brickmaking and Hosiery. 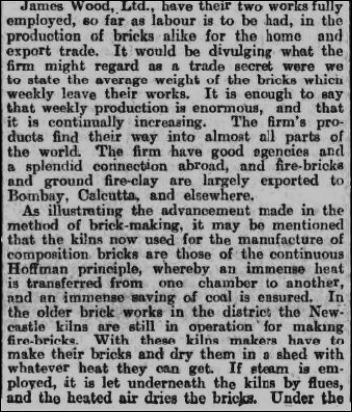 A promising revival in certain industries in West Lothian is reported notably to the manufacture of bricks and hosiery. 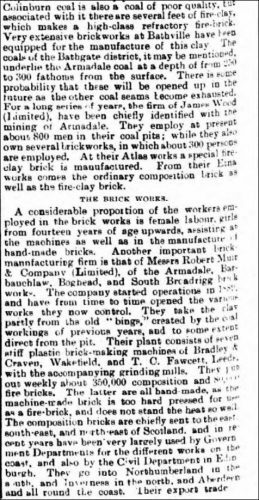 One of the busiest places in the country at the moment is the Etna Brick Works, at Armadale, belonging to the United Collieries Ltd. An official stated that there had been a sudden revival of trade, and they were supplying the demand as it occurred. A few weeks ago the daily output of bricks from the works was 25,000, and last week the figure was almost 55,000. Not only has the spurt to the industry been responsible for the employment of additional men, it has been found necessary to put on a night-shift. 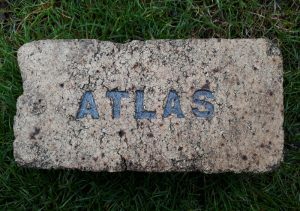 A large number of the bricks have been sent to Glasgow for housing achievement. 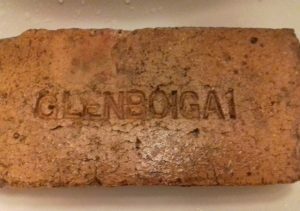 This output of bricks is regarded as a really high for a brick work in the provisional housing schemes in progress in West Lothian are being supplied. The prospect of the brick trade are promising. At the company’s other brick works at Bathville the employees are also busy………………………. 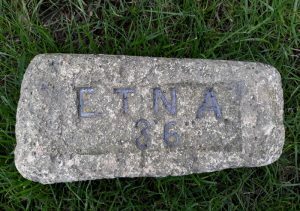 Below – 1938 – Etna Brick Works. 1947 – United Fireclay Products Limited comprised of the Etna and Atlas Firebrick Works, The Bathville Pipe Works, the UNICOL Tile Works, all at Armadle and the Brownhill building brickworks at Clelland, Lanarkshire. Lower deand for refractories led to the Etna Works being converted to making building bricks under the ETNA brand and the closure of the Atlas Works in 1973. Gibbons Dudley took over the United Fireclay Products in 1971 and they were bought over by Steetley Ltd in 1981 who then sold the Etna and Brownhill Works to GISCOL Ltd..